I'm always happy when I see that an author is just as delightful as their books make them out to be, and this was certainly the case with this interview. Lana Popović is the author of Wicked Like a Wildfire, her debut young adult fantasy novel that deals with using magic to manipulate beauty. The story itself is told beautifully, with lush, magical prose and a setting readers can get lost in. It's a tale of sisters and love, magic, emotion, and beauty, which doesn't shy away from showing the dark side of all of these things. It also explores the contradictions young women experience as they grow, "Be beautiful, but not too beautiful." "Be powerful but don't scare people away." "Be independent, but at the same time submissive..." It's a book that is sure to strike a chord with many. Please welcome Lana Popović to the blog! Melanie R. Meadors/The Once and Future Podcast: Congratulations on your new novel, Wicked Like a Wildfire, from HarperCollins! Could you tell us a bit about it? Lana Popović: Thank you, and of course! It’s a young adult contemporary fantasy, about witchy twin sisters with the gift of manipulating beauty through magic. When their mother is attacked and left hovering between life and death, they begin to unravel a thousand-year-old family curse, which forces them to face the secrets they’ve kept hidden and see how far they’ll go to protect each other. MRM: Was there something in particular you came across while writing your novel that make you “geek out,” whether a bit of research or a setting, etc? LP: Right before I wrote the book, I visited Montenegro to refresh my childhood memories of all the stunning scenery (and ridiculously delicious food!) I remembered from childhood summer spent there. From the votive shrine at Our Lady of the Rocks—which looks like something out of Mists of Avalon—to monasteries carved from cliffsides, it’s a place that just brims with ancient magic. I also had a chance to deep-dive into the world of handmade perfumes, which I mostly did courtesy of Aroma Sanctum in Salem and Black Phoenix Alchemy Lab. I learned about essentials versus absolutes—and accords! Those are a thing too!—and though I still don’t make my own perfumes, I’ve gotten to see real masters of the craft spin out such delicate, intricate scents that it’s basically magic. MRM: Your book has a very lyrical, fairy-tale-like voice to it. Is this something you have worked at consciously, or did the story just come out that way? LP: This story very much wanted to sound like a fairytale. I tried tweaking the voice closer to contemporary a number of times, both while drafting and revising, but it never sounded right to me when it veered more modern. MRM: You’ve been educated at Yale and Boston University, studying psychology, literature, and law. You’ve also studied writing and publishing at Emerson College. How would you respond to someone putting down YA as easy or being brainless drivel? LP: I would hand them a stack of Laini Taylor, Maggie Stiefvater, Jandy Nelson, Anna Marie McLemore, Jasmine Warga, Laura Ruby, Nova Ren Suma, Patrick Ness, Brittany Cavallaro, Rebecca Podos, Sarah Porter, April Genevieve Tucholke, and a slew of others. Then we could talk. MRM: Do you plot your work out beforehand? Or do you write by the seat of your pants? LP: I’m an absolute pantser. I have the arc in mind, and certain scenes that I know will happen and that I look forward to writing, but the space between them is often surprising and unpredictable. I do keep a document for the thoughts, sense impressions, and sentences I come up with while in the shower (what’s with that, anyway? We all seem to write in the shower! ), but it could only very loosely be described as an outline. MRM: What is your workspace like? Do you write anywhere in particular? Do you have any writing rituals? MRM: You’ve lived in several different countries, from Bulgaria, to Romania, Hungary, the US. Do you have a favorite place, or a place that feels more like home than another? LP: I’ve now lived in Boston for thirteen years, which is longer than I’ve lived anywhere else, and I know this city better than any other. This is home now, I think! MRM: How has being a literary agent affected your writing? Do you ever second guess yourself as an author because of knowing what happens on the other side of the business (for example, let a marketing issue nag you when you are making a writing choice)? MRM: I absolutely love the first paragraph of your book. A lot of authors agonize over their openings. What is your process like to get the beginning just right? MRM: Your book deals a lot with the subject of beauty. It can be really hard for teenagers to have a healthy perspective on their own beauty—they are going through a lot of changes, both inside and out, and so much of their identity can be wrapped up in their outer appearance. Is there any advice you would give to a teenager who is having a hard time feeling attractive? LP: I have a lot of feelings about this! I was an awkward-looking kid; glasses, braces, the standard redhead blond-eyelashes deal, with the added misfortune of a gorgeous mother (who’s also a lovely person, so you can’t even be annoyed by all that symmetry). I didn’t look much like her at the time—apparently we share some bone structure, but it took another solid ten years for it to see the light of day—and I heard about it constantly, usually along the lines of, “wow, your mother’s so beautiful! You look nothing like her, that’s weird.” I remember feeling both very hurt and really annoyed by this reaction, and to this day it stings that being pretty was of such paramount importance that the other things I was good at—school, jokes, making badass nachos with Doritos—seemed to pale into oblivion in comparison. To teens feeling this way, I offer all the hugs, and the assurance that it gets so much better. It really does. There are a million different ways to be beautiful that don’t entail looking like a Victoria’s Secret Angel (although kudos to those ladies. They work hard). All the “clichés” we hear about inner beauty are true, turns out! Be bold. Be creative. Be kind. Make stuff, love people fiercely, don’t be afraid to be tender or to ask for help. It’s all going to be so much more awesome than you think, I promise. MRM: When creating the magic for your story world, did you get inspiration from anything in particular? LP: I looked up so many flowers. So. Many. (The chocolate cosmos is still my all-time favorite flower name—it sounds divine.) I also spent hours browsing through fractal art, particularly suicidebysafetypin on DeviantArt, and watching unsettling and cool videos of polyphonic singing. MRM: What were some of your favorite books to read when you were a teen? LP: I had odd, eclectic taste as a young reader, largely based on what was available in the vicinity, in English. I ended up reading a lot of Sidney Sheldon (at way too young an age, shudder), Stephen King, Diana Gabaldon, and Robert Heinlein. MRM: Thanks so much for your time, and best of luck with your new book! I hope it’s the first of many delightful books we’ll see from you! LP: Thank you so much—I hope so, too! The sequel, Fierce Like a Firestorm, is out next summer, and I have some ideas for after, too! Lana Popović was born in Serbia and spent her childhood summers in Montenegro. She lived in Bulgaria, Hungary, and Romania before moving to the United States, where she now calls Boston home. 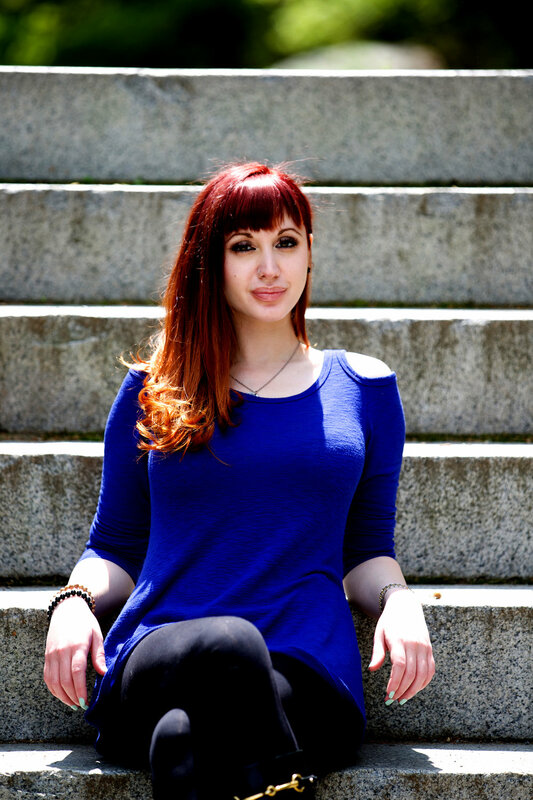 She works as a literary agent with Chalberg & Sussman, specializing in Young Adult literature. Visit her website at www.lanapopovicbooks.com.